I've had the good fortune of yet another American Indian jewelry collection coming my way, and that is what I'm going to present to you this month. The uniqueness of this new collection is that it's made up entirely of earrings. The previous owner was obviously a woman after my own heart as earrings have always been one of my favorite jewelry items, and this grouping is sure to delight! There are over 30 pairs of Native American earrings in this collection. 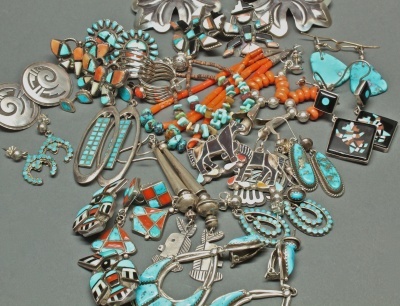 While they are all earrings, they're actually quite varied in their representation of jewelry from different American Indian groups including Navajo, Zuni, Hopi and Pueblo. For example, you'll find quite a few pairs of really good Zuni inlay earrings in different styles from sunface earrings to inlay thunderbird earrings and mudheads. You'll even find work from some of the greats like John Gordon Leak, Dan Simplicio and Dishta. Interestingly, in the Hopi jewelry realm, you'll find three different interpretations of Hopi overlay jewelry from early Hopi overlay earrings to a later pair that features a corn plant design along with others that have a parrot motif. In the Navajo and Pueblo pieces, there's also a little bit of everything from long coral jaclas to pretty coral and silver blossom earrings. Also of Navajo origin are the earrings from Kenneth Begay's daughters, Kay Begay Rogers and Sylvia Begay Radcliffe. Their perfectly executed work is getting more and more difficult to get a hold of, so I'm very happy to have it here. I am also quite pleased with this collection because it has in it a wide range of earring sizes. For the days when you want to be noticed, look no further than this fantastic pair of long silver cone dangles. When you want a much more subtle look, you may enjoy these sweet Navajo silver hoop earrings. As if the earrings need anything else to make them more enticing, I've marked quite a few of them on sale so that you have all price points available from high-end John Gordon Leak dangles priced over $1000 to a few pairs under $100 including one pair of silver hoops priced at only $45 and so sweet that you may find yourself wearing them daily. There are just so many earrings here that I'd love to add to my personal collection. I know you'll want to do the same. Can you resist these adorable Zuni horse earrings or these Navajo Yei earrings? I'm having a hard time too!